IPOC (Integrated Plate Boundary Observatory Chile) is a European-South American network of institutions and scientists organizing and operating a distributed system of instruments and projects dedicated to the study of earthquakes and deformation at the continental margin of Chile. Schematic section of the subduction zone between the oceanic Nazca plate and the South American continent in northern Chile. The surface shows different components of the IPOC Observatory. This plate boundary between the South American plate and the oceanic Nazca plate exhibits some of the largest earthquakes on Earth as only recently manifested by the disastrous M 8.8 earthquake of February 27th, 2010, in South Central Chile. Earthquakes and volcanoes are driven by convergence between the two tectonic plates. Our goal is to improve the understanding of both the physical mechanisms underlying these processes and the natural hazards induced by them. We therefore integrate modern ground- and space-based technologies to observe and interpret active deformation related to the subduction seismic cycle. The northern part of the Chilean margin offers an exceptional opportunity for such studies: the more than 400 km long plate boundary segment between Antofagasta and Arica, capable of a giant magnitude 9+ earthquake, has not been broken for more than 120 years. This is the longest time period between large earth-quakes along the Peru-Chile coastal margin, putting this segment in the terminal stage of a seismic cycle. The neighbouring segments to the south and north have been broken in 1995 and 2007 and 2001 respectively, enhancing the stress in between. First seismological analyses of the M 8.1 earthquake of April 1st 2014 have shown, that tension has been released only in the central part of this segment and that there is no sign that the stresses in the Earth's crust has significantly decreased. The observatory is designed to monitor the plate boundary system from the Peru-Chile state boundary to south of the city of Antofagasta, from the coast to the high Andes and capture the great earthquake in this seismic gap. 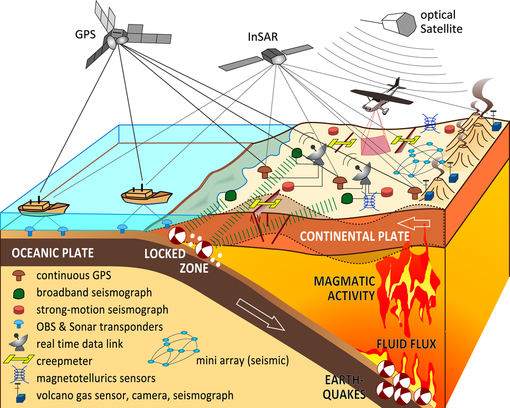 In contrast to conventional observatories that monitor an individual signal only, we have designed IPOC to capture a large range of different, possibly associated deformation processes by using different geophysica and geological observation methods (seismographs, strong-motion seismographs, GPS, magnetotelluric sensors, creepmeter, accelerometer, INSAR, etc.). to enable developing a simple, robust, and efficient earthquake monitoring technology. The Integrated Plate Boundary Observatory Chile (IPOC) is located at the forearc of South Americas Plate Boundary with the oceanic Nazca Plate.